The day before Christmas saw us in port at Dominica. This was the first of two SCUBA diving excursions that I had booked. Heather doesn’t dive, so she booked her own excursion. We got off the ship together, and I saw her off, then waited for my own tour to start. We caught the Dive Dominica boat right at the dock, and headed out to the first dive site. The guides were professional but still fun, helping us get set up and ready to go. Our first site was called Soufriere, a wall dive along a vertical section of coral reef. This was my first ever ocean dive, and I’ve got to say that it was one hell of a way to kick things off. 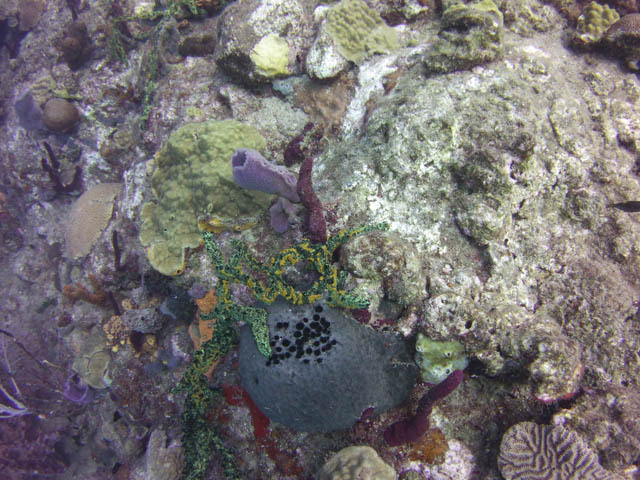 We saw an incredible variety of coral, in all the colors of the rainbow, as well as many species of colorful fish. Maximum depth for this dive was 62 feet. We surfaced, changed tanks, and headed to our next site while chatting through the surface interval. Our second dive site was along Champagne Reef. It got its name thanks to the geothermal and volcanic activity. There are underwater hot springs and gas bubbling up in areas, all a remnant of the volcanic forces that created the island. We started off diving another wall, heading down to 59 feet maximum depth, before heading back up and over to the geothermal activity area. It was really interesting to see the gas bubbling up from the ocean floor, and feeling the hot water flowing out of the springs. It was hot enough that you’d get some pretty severe burns if you kept your hand in there too long. Sadly, that was the final stop on the final dive of the day, so we surfaced and headed back to the ship. Once there, I went back to the cabin and started rinsing and cleaning the gear. After cleaning the gear and myself, I got changed and headed back out to meet up with Heather and do a little shopping at the open air market that had set up next to the ship. We found some nice gifts, and some spices, as we browsed the wares. Finally we made our way back to the ship, and repeated our dinner and laps routine.